Acme threaded spindle for quick, smooth clamping operations. Non-marring plastic cap on the pressure pad for delicate surfaces. Zinc die cast jaws are light in weight but offer a nominal 330 Lbs. of clamping force. Serrated rail enhances the positive grip of the cast arm to the rail during clamping activity. 4-inch Light Duty Clamp with Wood Handle and 2-inch Throat Depth Strong yet light in weight, these handy little clamps are made for light-duty clamping in hobby, craft, woodworking and do-it-yourself projects. The LM clamp series is small in stature, but big on full-sized features such as an ACME threaded screw, serrated rail and non-marring pressure pad. 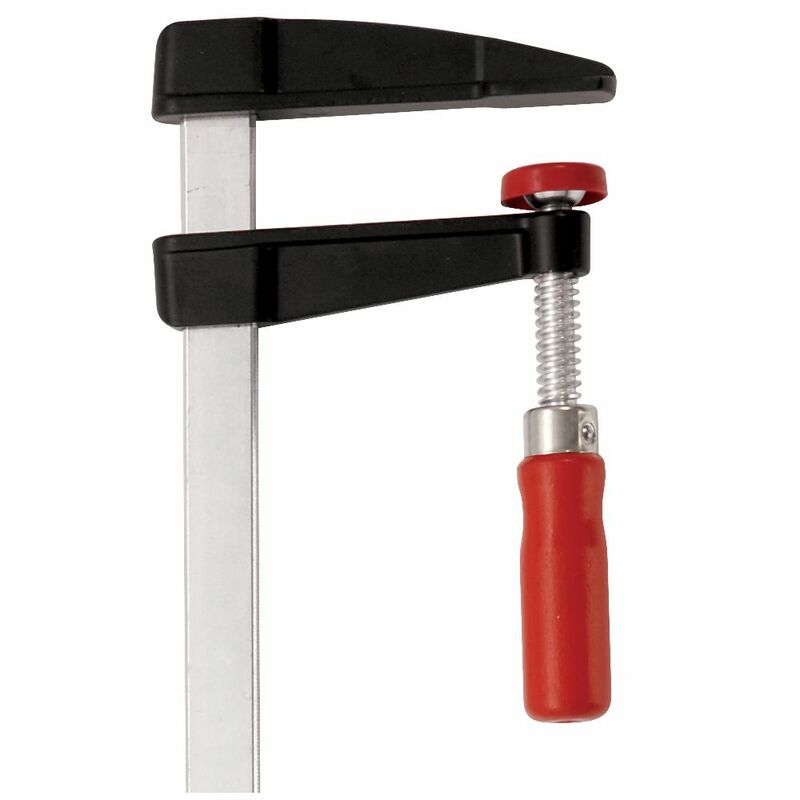 4-inch Light Duty Clamp with Wood Handle and 2-inch Throat Depth is rated 4.6 out of 5 by 28. Rated 5 out of 5 by Bob from 5 star. Did the job I needed.... 5 star. Did the job I needed. Rated 5 out of 5 by mike from this clamp holds great and just perfect for gluing up wood projects, I just seem to never have e... this clamp holds great and just perfect for gluing up wood projects, I just seem to never have enough. Rated 5 out of 5 by Sirroutesalot from Great clamps. I would buy them again. ... Great clamps. I would buy them again. Rated 5 out of 5 by ayeronnie from Bought one of these the other day, thought it might come in handy. I do quite a fair amount of wo... Bought one of these the other day, thought it might come in handy. I do quite a fair amount of woodworking and home renovations. I absolutely love these little clamps. Seems I keep finding uses for it. For clamping all kinds of things to using it as a stop for when cutting with my miter saw. I have a couple 2x4 to put the stock on and this clamp fit perfectly as a temporary stop. Will be picking up more of these. As we know, you can never have enough clamps. Rated 5 out of 5 by Gordon from Really sturdy clamps....will hold just about anything. Would like longer handle to get more leve... Really sturdy clamps....will hold just about anything. Would like longer handle to get more leverage, but does the job!